Fabulous DIY Crochet Patriotic Mason Jar Covers - Free Patterns! Home » Patterns » Fabulous DIY Crochet Patriotic Mason Jar Covers – Free Patterns! Fabulous DIY Crochet Patriotic Mason Jar Covers – Free Patterns! Jar covers are popular again and so easy to crochet! And with these fabulous patterns, you can show your patriotic spirit, whether for the 4th of July holiday or year round! A crochet jar cover is just one of the many ways to re-purpose the iconic Mason jar. And also a reminder that jars have so many uses that go far beyond food storage and/or the recycling bin. This is a prime example. As you can see in the photo above, much like a doily this crochet cozy can transform a simple ordinary glass jar from a kitchen item to a decorator accent. Well, the good news is that this is an easy and quick project and a lovely example of upcycling. 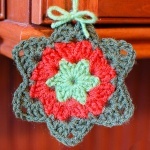 This wonderful free pattern is by Erica of 5 Little Monsters. You’ll find a written pattern plus lots of photos! This is another fantastic Mason Jar cover! It’s the Patriotic Mason Jar Utensil Holder by Kara of Petals to Picots. It’s perfect for your summer picnics! 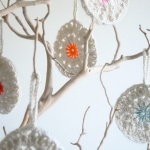 And for even more fantastic upcycling projects, check out the following here at Crochet Maze!